With those unfamiliar with The Ford Brothers, they grew up in Ukiah, a small lumber town in Northern California and were playing in bands together before leaving high school. Robben and Patrick joined up with Charlie Musselwhite after leaving school. After a year or so touring and recording with Charlie they left to start a group named after their father and were joined by their youngest brother Mark. The band was the Charles Ford Band and though it only existed about a year it made a big impression on the west coast blues scene and received praise from the likes of Muddy Waters and Elvin Bishop. Chess Records even offered them a recording contract to record with Muddy, an event which never happened as the band broke up shortly after that. In 1972, several months after the breakup, they got back together and recorded what has become a modern blues classic for Arhoolie Records that still sells CDs. Though the brothers went their own ways they all stayed involved in music on one level or another. Robben Ford gained the greatest recognition of the three brothers with his solo work in the jazz and blues fields as well as with his work with other artists like Jimmy Witherspoon and Miles Davis. Several Grammy nominations have come his way. Patrick founded Blue Rock'It Records to record artists he felt were being ignored. Artists like Charlie Musselwhite, Brownie McGhee, and Chris Cain are among those careers were aided or even revitalized by Blue Rock'It. He then formed the Ford Blues Band to remain an active musician himself and the band records and tours internationally. Though Mark, the youngest of the three, has chosen to remain somewhat inactive through the years, he is without a doubt one of the greatest harp players on the blues scene. He has recorded several releases for Blue Rock'It using Robben and the Blue Line for the band. These have been best sellers for the label. 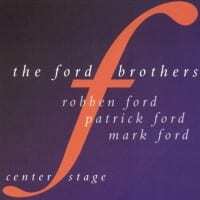 "Center Stage" release is another example of The Ford Brothers getting together to have some fun and make some great music .... Ford Style and Family Style. Special thanks to all the wonderful people at Sierra Nevada Brewery for all the help. 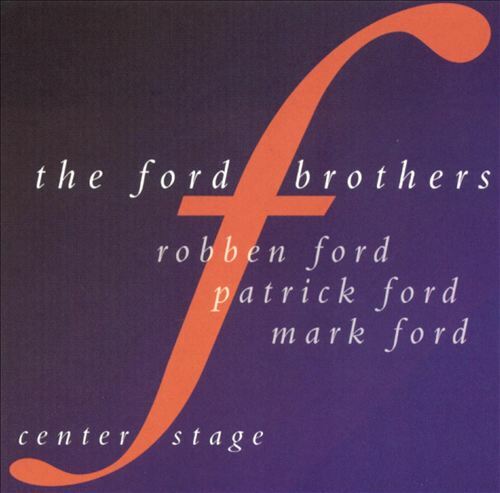 The three Ford Brothers (guitarist-singer Robben, Mark on harmonica and drummer Patrick), along with guitarist Volker Strifler and bassist Dewayne Pate, play a full set of very spirited material. The traditional "Good Morning Little Schoolgirl" is a high point but so are the pieces from Walter Jacobs and Paul Butterfield plus the five group originals. The interplay between the guitars of Robben Ford and Strifler form a powerful group sound and on "Good Morning Little Schoolgirl" the addition of guest guitarist Chris Cain adds to the fireworks. This set will be enjoyed by fans of post-1960s electric Chicago blues and features each of the Ford Brothers in prime form.